The Beech 18 Matt performs (serial number 4383) in was built in 1943 by the Beechcraft Corporation at Wichita, KS. Designated an AT-7C, the airplane was bought new by the United States Army Air Corps and spent the duration of the war as a navigation trainer based at Houston’s Ellington Army Air Field. In 1945, the Army transferred ownership to the Civil Aeronautics Administration (CAA) which would later become the Federal Aviation Administration (FAA). Redesignated a C-18S and registered as N52, the airplane served with the CAA until 1949. The airplane was then reregistered as N59 and served as a VIP transport for the United States Department of Commerce until 1959. The airplane was then reregistered as N9109R and went through several owners including a drop zone and a university before being purchased by Bobby Younkin Airshows, Inc. in 2000. After a complete restoration, N9109R was pressed into airshow service as a replacement for N9729H, Bobby’s original aerobatic Beech 18. After Bobby’s untimely death in July of 2005, the Beech spent two years in retirement as a static display in Tullahoma, TN. Matt debuted his rendition of Bobby’s airshow routine in the famous Beech at Sun-n-Fun 2007. Matt debuted his original night show in the Beech at Sun-n-Fun 2008 and has been performing in the airplane ever since. 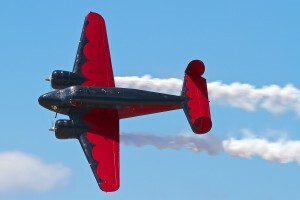 The Beech 18 is the flagship of Matt’s airshow fleet. Matt considers this airplane the most special of the three that he performs in. Bobby first gained national notoriety in his airshow Beech in 1990 and continued performing aerobatics in Beeches for 15 years. Look for airshow appearances in the Beech 18 for many years to come. The Super Decathlon Matt performs in was built by the American Champion Corporation in 2004. This is the same Decathlon that Bobby performed in at Oshkosh and Sun-n-Fun in 2004 and early 2005. Bobby bought the Decathlon with the intention of teaching both Matt and his sister Amanda aerobatics. After his untimely death in July of 2005, Matt took the Decathlon out and taught himself aerobatics in it. Bobby had flown with Matt twice in the airplane and worked with him mainly on slow rolls. 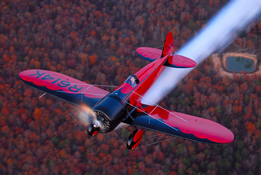 Bobby stated that the slow roll is the key to almost every aerobatic maneuver. If you can master the slow roll, you can master anything. Matt took this to heart and once he perfected his slow rolls, Matt used his RC model airplane skills to teach himself aerobatics, just as Bobby had done many years before. Matt’s first airshow was in the Super Decathlon and his sister Amanda took her check ride for her private pilot’s license in this airplane as well. The Travel Air “Mystery Ship” was designed and built in 1928 by the Travel Air Aircraft Corporation of Wichita, KS. Designated the model “R” the aircraft was designed and built for the upcoming 1929 National Air Races. Design and assembly of the aircraft was performed behind a curtain in a sealed off portion of the aircraft plant. It was only dubbed the “Mystery Ship” by the press after attempts to acquire information on the top secret project failed. On September 2, 1929, the date of the Cleveland National Air Races, the model “R” was finally revealed to the press and the rest of the world and easily took 1st place, beating every entry put forth by the military. This was the first year that a military aircraft had not won the National Air Races. The civilian design proved far superior and served as a wake-up call to the U.S. Military to increase funding for pursuit aircraft design and production. The “Mystery Ship” that Matt is performing in today was re-created using original factory plans by Jim Younkin in 1979. Although the Younkin airplane is a replica, it is the only example worldwide of a Travel Air “Mystery Ship” flying today.